If zombies ever run out of brains to munch on, they might look to the sea for more. They can find brains that are up to six feet tall and live for almost a millennium. The brains might be a little crunchy, though -- they’re corals, so they consist of a hard skeleton with a thin coating of living organisms. 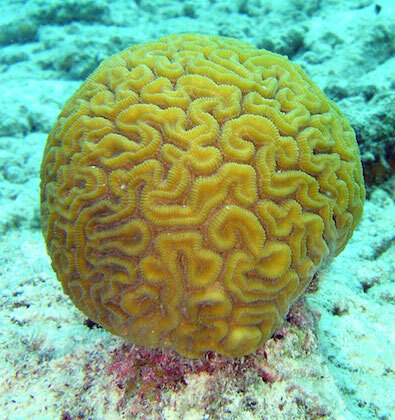 Brain corals are generally round or oblong, with a wrinkled surface that looks like the contours of a human brain. They’re found in tropical waters in the Caribbean, the Gulf of Mexico, parts of the Atlantic, and elsewhere. They’re made by coral polyps -- small organisms that cluster together in colonies. The polyps produce calcium carbonate -- a rocky substance that forms a hard skeleton, with the polyps living on the outer surface. The skeleton gets bigger over time as polyps die and new generations make their homes on top of their remains. Unlike the polyps that make up some other corals, those that make brain corals are all connected. They can exchange food, oxygen, and other substances. That makes the colony more efficient. But it also makes it more vulnerable to disease. Brain corals grow slowly. In fact, the oldest may have been around for 900 years. As they grow, they become sturdy anchors for coral reefs. They provide protection for fish and other organisms. And they can absorb the energy of storms. That helps insulate the coast from storm surges and other damaging effects. So protecting coral habitat is a “brainy” way to protect the coast from hurricanes -- if not zombies.